BEIJING — Two years after the massive earthquake that devastated China’s Sichuan province, families of the thousands of missing people can on Wednesday finally register their loved ones as dead. Under Chinese law, relatives of the 18,000 missing people can only register their family members as dead two years after they disappeared http://viagraindian.com/products/viagra/. 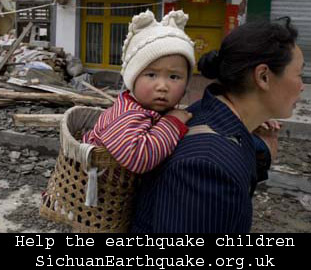 Nearly 70,000 people were killed in the May 2008 quake that devastated parts of the southwestern province and rattled a nation preparing to host the Beijing Olympics. While the state-controlled press lavished praise on the government quake response and reconstruction effort on Wednesday, critics organised protests in honour of the thousands of children killed when poorly-built schools crumbled. Posted in News | 45 Comments » | Read more..